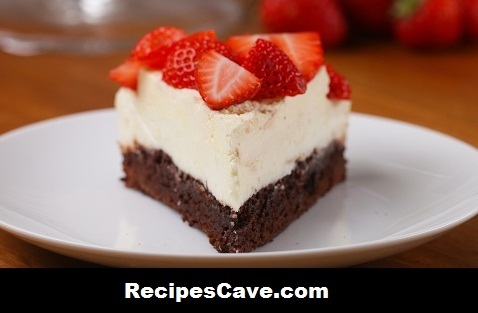 Strawberry Brownie Cheesecake Recipe- Here is what you'll need to cook. 2. Prepare the brownie mix, following instructions on the box. 3. Pour into a greased 9-inch springform tin. 4. Bake in the oven for 20 minutes and leave to cool. 5. Prepare the cheesecake filling by whisking the cream cheese, sugar, and vanilla extract until smooth. 6. Scatter the gelatin over the hot water, mix together, and combine into the cheesecake filling. 7. Spread on top of the brownie base. 8. Chill for 4-6 hours, until set. 9. Spread the whipped cream on top, followed by the strawberries. your Strawberry Brownie Cheesecake Recipe is ready to taste.